Are you as angry as I am about the new "Ag Gag" bill passed by both the house and the senate here in Iowa yesterday?! I cannot believe in a state that has one of the worst reputations for puppy mills and huge factory farming of animals that we would silence and punish people trying to help bring animal abuse to light. 10:30 am - W. Mall of the Capital Building, corner of E. Grand and E. 9th st.
A Silent Protest will be held outside of the Capitol building in Des Moines, against this dangerous and secretive "ag-gag" law. We are looking for as many people as possible to attend our protest tomorrow, Thursday March 1st. We will be meeting at 10:30 a.m. on the West Mall of the Capitol building, at the corner of E. Grand and E. 9th. We ask everyone to please wear all black. We will provide signs and be wearing tape over our mouths and blindfolds over our eyes to symbolize what these bills do - they prevent people from speaking out and exposing factory farms, and they prevent society from seeing what goes on behind the closed doors. This ag-gag law will make it a felony to take a video or photograph of a factory farm, or do any kind of undercover investigative work like MFA does - which often result in criminal convictions, corporate animal welfare policy changes, the advancement of animal welfare laws, and heightened public awareness about cruelty to farmed animals. This is the first ag-gag bill to pass in the U.S., and would set a dangerous precedent for other states to pass them as well. Currently, nine other states have ag-gag bills pending. Doing a demo would likely garner national media coverage as this would be the first passage of such a controversial, precedent-setting bill. I LOVE potatoes. Cook them any way you want and I will eat them. When I was a kid my mom made scalloped potatoes as a side dish, or added vegetables and meat and made it a meal. It is one of those comfort foods from childhood that I have missed since going vegan. Up until last night, I had not been able to master a tasty vegan recreation. I searched through different recipes for inspiration and then looked at my fridge to see what I had. The result: a creamy, perfectly seasoned, “cheesy” potato heaven. Coconut milk for baking is my favorite thing in the world and it is perfect in this recipe. 2. Cut potatoes in thin slices. Layer potatoes, spinach and Daiya in the baking dish. Save some cheese for the top layer. 3. In a mixing bowl combine coconut oil, corn starch, sour cream, nutritional yeast and spices. Blend well to get out any lumps. 4. Pour liquid mixture evenly over potatoes. Sprinkle remaining cheese, a bit of cilantro and salt and pepper on top. 5. Bake uncovered for 50-60 minutes. Use a fork to test if extra time is needed. Feel free to add other vegetables, broccoli, corn, etc. Also, add in a protein of your choice, it should bake really well. We added some of Upton’s Italian Sausage Seitan and it was really delicious. If you add anything else, share to let everyone know how it works! I get to travel all over the state for work and this can make eating out a bit of an adventure. 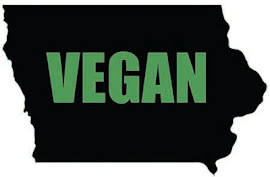 A project I have been wanting to tackle for a really long time is a comprehensive list of restaurants that are vegan, vegetarian or veg friendly here in Iowa. I've added pages to this site (located on the top right hand side) directing readers to restaurants near you that are great vegan options. However, one diner cannot make the list alone and I need your help! (I really do not eat THAT much) Share your favorite vegan places to eat in Iowa City, Des Moines, Cedar Rapids, Sioux City, Mason City and across the state! Your hot spots will be added so we can share the vegan love with everyone. Red Avocado for Valentines Day!!! The best gourmet vegan restaurant in the world closed last month. Developers gave the Red Avocado 30 days to vacate and shut down the business which has thrived for the past 12 years. Petitions circled and voices raised, but the development won. The restaurant has not announced plans for reopening or relocating. However, special meals are being planned for the faithful vegan followers of this cherished Iowa City restaurant.The first, is a Valentines Day meal! Chef Dave is planning A Valentines Day 4-5 course meal to be served at the Hillel House. Reservations can be made by emailing dave@theredavocado.com. There are more details on the Red Avocado Facebook page. Also, if you are a busy person on the go and are interested in the Red Avocado meal plans they are also still available. Red Avocado has always been that special place for me where I shared birthdays, New Years, Valentines, Solstice, and many other special memories with friends and loved ones. It will always hold a special place in my heart. My favorite dish was the College Green Sunset with cup of steamy spiced hot chocolate. A toast to the Red Avocado, Dave and the staff who made it a vegan icon in Iowa City. Thank you to the Red Avocado staff and chefs who served up wholesome, organic, vegan goodness for the community to enjoy. Thank you for supporting the community month after month and year after year with your goodwill and donations. The award winning restaurant deserves to be remembered. Many blessings to the staff and their families as life moves forward with new endeavors. If there are any other special community meals or holiday feasts, I will be sure to share them here!! Fresh Café is a breath of fresh air. Literally, when you walk through the doors it smells like a fresh spring garden with a few spices blended in. This is because they specialize in wheat grass and so everything smells fresh! They have modern seating, with a light and comfortable atmosphere. What a fabulous hidden jewel in Des Moines! I have bemoaned the fact I couldn’t get fresh baked vegan goods in Des Moines and it was right by me all this time! My co-worker Sara ventured out with me for a wonderful lunch! In case you have not been to Fresh, it is tucked behind a few shops off of University and 25th. (The road across from Toys R US). Kerri Rush, the owner of Fresh Café, greeted us and told us about the background of the restaurant. Fresh Café has been around for seven years, and has been vegetarian/vegan/raw for about three years. The menu features sandwiches, entrees, drinks and of course dessert! All of the menu items can be made vegan and there are a few raw dishes as well. Their vegan black bean brownie is a hot seller and sounds like it may not be a dessert but it is phenomenal! YUM! All of the baked goods are vegan, and you will also be able to pick up raw treats as well. There was a very steady lunch crowd and everyone complimented their food. For lunch I tried the raw pasta dish and Sara had the apple melt. Admittedly, this is where I am mad at myself for losing the take home menu – because I can’t remember the name of the actual dishes – but at least the essence is here. The base of the pasta was a zucchini “noodle” served on a bed of spinach with a tomato and pesto sauce on top. This is the perfect cool down dish for a hot summer day, and it worked just fine on a winter day in January as well. Delicious! Sara's sandwich served on honey wheat from Big Sky Bakery, was topped with melted cheese, spinach and apples. This sandwich can also be made vegan – they sub my favorite vegan cheese, Daiya. Sara is a meat eater with a teenage daughter who has become vegetarian. She took home some ideas for meals with her daughter and was already making plans to visit again while we were eating. This is the whole reason we were there. We got to taste test a few cupcakes, the black bean brownie, a chocolate chip truffle and WOW! The cupcakes are the lightest, fluffiest vegan baked cupcake I have EVER had. It was melt in your mouth good. We tried three flavors, chocolate, vanilla and apple cinnamon. I’m a sucker for chocolate and it did not disappoint. The apple cinnamon had great flavor and would make a good fall cupcake. They were a teeny bit crumbly but made up for this by being so delectable. Fresh Café does cater cupcakes for parties, weddings, or any special day! In case you were wondering, the black bean brownie does NOT taste like black beans. It tastes like a really fabulous soft chocolate brownie treat, and the fact it is healthy and vegan is a huge bonus. They are sized very generously and are pretty much guilt free in my book. We left with more goodies, full stomachs and huge smiles. Sara got a treat for her daughter and another co-worker. Let’s just say our co-worker finished off the cupcake in 3 bites with a HUGE smile on her face. Yes, it was a good cupcake even for non-vegans! Kerri is considering expanding, so we may see another Fresh Cafe pop up locally and this will only spread the goodness through the metro. Visit Fresh Cafe and enjoy!